She sent me the goddess she made, and she is just so exquisite!! 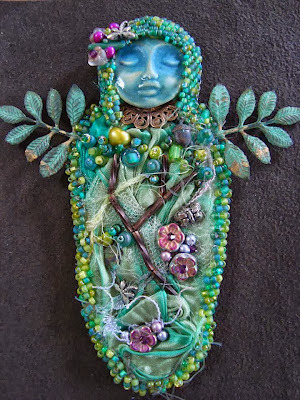 If you look closely at the photo, you can see tiny little acorns and the beautiful fibers Julie used, dragonflies, flowers, gorgeous branching wings and the sweetest face... just like Julie herself. It's very special to me - we had so much fun doing the class 'together' online, and this was a huge surprise to me, I had no idea Julie would give her to me!! I can't reveal my goddess yet, as I am still waiting for Sherwood's flash camera part thing to come... the first one didn't work!!! Now, before you read any more... go and read Julie's blog, please - she tells the story so much better than I can. If you've gone and read it, you know what a huge honor Julie did me. It took me a very long time to actually create the necklace, and Julie was very patient with me. I had so many things happen this year that weren't good ones - and I didn't want to work on the piece when I wasn't happy or feeling good. NO bad moods or sadness while making it, nope nope nope. So I worked on it when I was ok and things were ok, and I tried very hard to make something that would reflect Julie's love and care of her Mother. It was such a huge gift Julie gave me, to ask me to make this necklace. I was terrified of sending it off when it was finished, because I was so afraid that she might not care for it - especially the beaded bits on the beads her Mom made, because I wasn't sure that covering even part of them up was an ok idea... The bands of RAW on the beads were made to cradle them, and protect them, in the same way that Julie cares for and protects her Mom, and I left as much space as possible between the bands so that her beads would show through. I chose purple because I know Julie loves it, and because it really set the turquoise off in the beads. Each one is different, and has a different bead count because the beads were so one-of-a-kind themselves. I strung it with lampwork by Irish at Lampwork Beads and Juls of Julsbeads, sterling beads and made loops with more silver at the ends, and then made a hexagon rope with a sterling flowery clasp because Julie loves nature and her garden so much; I wanted it to be as full of things she loved as possible. It means the world to me that she likes it - and that she put it on right away when she got it today. Love you, lady bird - thank you SO much for asking me to make this special piece for you. Both gifts were created with such love and care. It is a very special bond the two of you have formed. What a heartwarming story, and a beautiful work of heart-felt art. Bravo!! !